DSSSB Notification is out. DSSSB is recruiting for 204 Various Post Govt Job Posts. 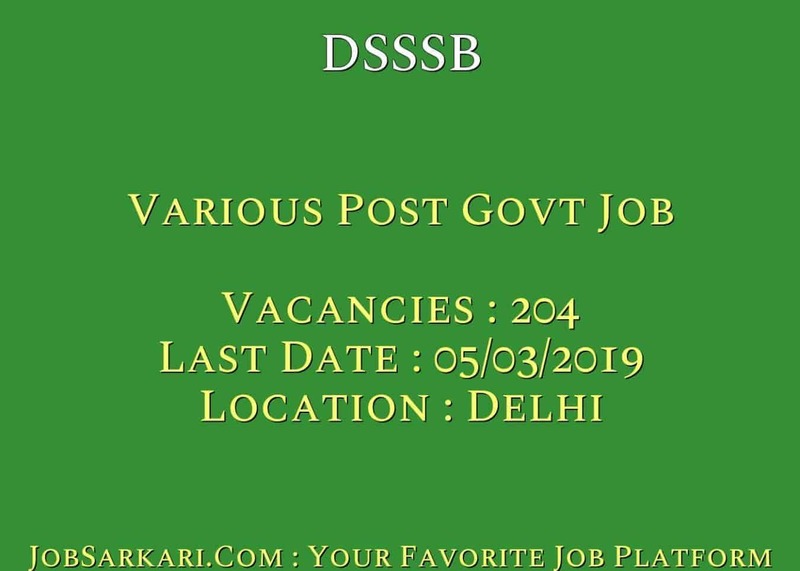 You can check DSSSB - Delhi Subordinate Services Selection Board last date, download DSSSB notification, visit DSSSB official website and check other DSSSB Vacancy details.Complete Vacancy and recruitment Details about 204 Various Post Govt Job vacancies in DSSSB are provided below by JobSarkari.Com only for you. Last Date of Apply Online. 05/03/2019. SC/ ST/ PH/ Female/ Ex Serviceman. No Fee. Mode of Payment. Candidate Can Pay Application Fee Through Debit Card, Credit Card or Net Banking. Lower Division Clerk 14 07 04 02 27. Stenographer Gr.II 05 01 00 00 06. Jr. Lab Asstt. 05 01 01 00 07. Legal Assistant 04 01 00 00 05. Scientific Assistant 01 00 00 00 01. Jr. Environmental Engineer 26 12 07 03 48. Welfare Officer/ Probation Officer/Prison Welfare Officer 55 31 16 08 110. Total No. of Post 110. 53. 28. 13. 204. Lower Division Clerk Candidate Must Have Passed Class 12th or Equivalent Qualification and Typing speed of 35 w.p.m. in English or 30 w.p.m. in Hindi on Computer (35 w.p.m. in English or 30 w.p.m. Correspond to 10500 KDPH/9000 KDPH on an Average of 05 Key Depressions for Each Word.) Mini 18 and Max 27 Years. Stenographer Gr.II Candidate Must Have Passed Class 12th 12th pass or equivalent And Speed of 80 w.p.m. in Shorthand and 40 w.p.m. typewriting in English. Or Speed or 80 w.p.m in Shorthand and 35 w.p.m. Typewriting in Hindi. Mini 18 and Max 27 Years. Jr. Lab Asstt. Candidate Must Have Passed 12th Class Passed with Science Stream with 03 Years Experience in Laboratory Works Or, Degree in Science from a Recognized University/Institution. Mini 18 and Max 27 Years. Legal Assistant Candidate Must Have Passed Degree in Law And Having 03 Years Experience as Legal Practitioner or 01 Year Experience in Legal Work in a Government Department. Maximum 30 Years. Scientific Assistant Candidate Must Have Passed Master’s Degree in Science and Having 02 Years Experience Laboratory Work. Maximum 30 Years. Candidate Must Have Passed 03 Years Diploma in Engineering in Environment / Civil and 03 Years Experience in Pollution Control Activity/Sewerage Works is Required. Maximum 30 Years. Welfare Officer/ Probation Officer/Prison Welfare Officer Candidate Must Have Passed Master’s Degree in Social work or Master of Art (Sociology) or Post Graduate Degree in Criminology. Maximum 30 Years. 1. One Tier/ Two Tier Examination. 1. Candidates Need to Apply Through Online Mode. 2. Click Apply Online Link As Given on Our Website in Important Link Section. 3. Candidates Need to to Register Before Applying for the Post and Already Registered Candidate Not Need to Register Again. 4. After Successful Registration system will Generate a Login ID and Password on your Screen. 5. Login with the ID and Password Then Start Filling Your Application Form and Read All the Instruction Before Applying for the Post. 6. Candidate Are Required to Upload the Scanned Copy of Documents as Mention in the Application Form. 7. Online Application Can be submitted On or Before 05th March 2019. Q. What is the Last Date For DSSSB Various Post Govt Job Vacancy ? A. 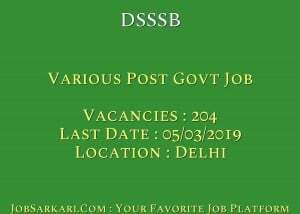 Last Date for DSSSB Various Post Govt Job Posts is 05/03/2019. Q. What is the Form Type of DSSSB Various Post Govt Job Recruitment ? A. The Form Type for DSSSB Various Post Govt Job Posts is Online. Q. How many vacancies are available in Delhi Subordinate Services Selection Board Various Post Govt Job Posts ? A. There are about 204 Vacancies in Delhi Subordinate Services Selection Board Various Post Govt Job Posts. Q. What is the Full Form of DSSSB ? A. Full Form of DSSSB is Delhi Subordinate Services Selection Board .